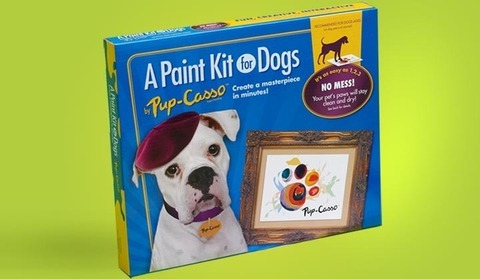 Have you ever dreamed of your pet becoming the next Pup-Casso or Kitty-Casso? Me either. 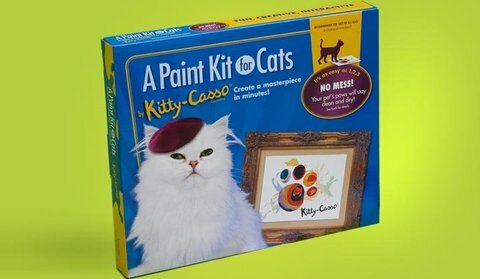 But if your imagination can muster up the vision of your pets walking on plastic wrap-covered paint globs, then these Art-Casso kits are all you need. ... but if you're really into showing off your pet's artistry, you'll want to take the Mug-Casso with you wherever you go. 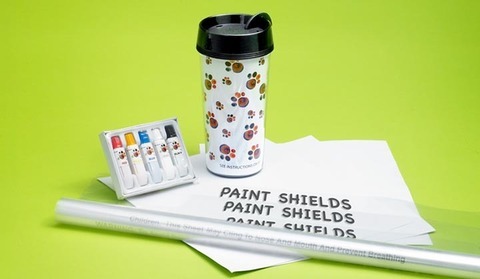 The kits come with a frame (suitable for standing up or hanging on the wall), 3 pieces of canvas, 3 paint shields, and 5 tubes of non-toxic paint. You frame a sheet of canvas, lay globs of acrylic color on it, cover it with one of the shields and let your cat or dog walk on it. The mural kits come with an enticement to get your pet more creative: a dog or cat toy, which you can dangle or through over the canvas to encourage movement in the right direction. The Mug-Casso comes with a travel mug. Certainly these kits can be used by any of your pets, two-legged or four, and if they don't offer them hours of riotous enjoyment, they will, in the end, at least give you something to brag about! Is Letting Your Pets Go To Pot, A Toke Too Far? Tiny Kitten Rubbins! The Animal Video Of The Day!! !